This courtyard was transformed into a bright outdoor room that connects inside and out. The design incorporates the ceramic floor tiles used in the adjacent kitchen, making the courtyard read as an expansion of this indoor space. White wall panels mounted over the existing brick walls also brighten the space. Black granite accents in the kitchen island counter, paving, and curbing provide a sharp contrast to the white materials. The black granite paving and stairs are located where the daily access route is from the upper parking level to the lower courtyard, providing a clear separation from circulation and gathering spaces. A raised corten steel planter I the focal point of the courtyard, and contrasts with a simple birch grove in front. This raised planter also provides a visual buffer of the cars parked in the upper courtyard. The planting palette includes woodland plants that thrive in this shady nook, and selected for their simple textural leaf contrasts and white flowers. 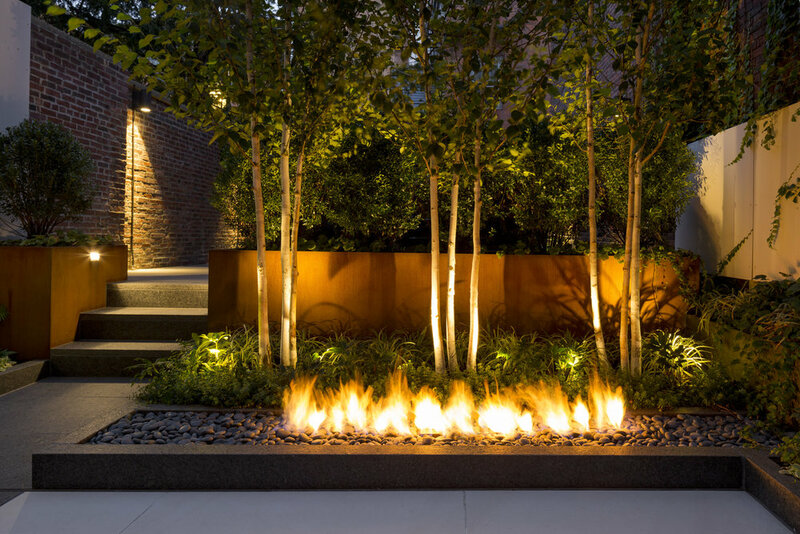 A low fire feature and accent lighting provide ambiance in the evening.